Free French baby and toddler group in south east London. 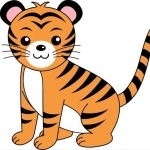 Fun in French for under 5s with songs, rhymes and stories! Hello: I wonder if you'd be interested in my French/English books for children. Although they're intended for kids who have at least a base in the target language (the books are NOT translated - each character speaks to the reader in his or her own language, much the way kids experience their own bilingual lives), a number of groups I know read them to young children with little or no exposure to two languages - and they still *get* it!. To see what I mean, I invite you to look at bettyandcat.com.Thanks!